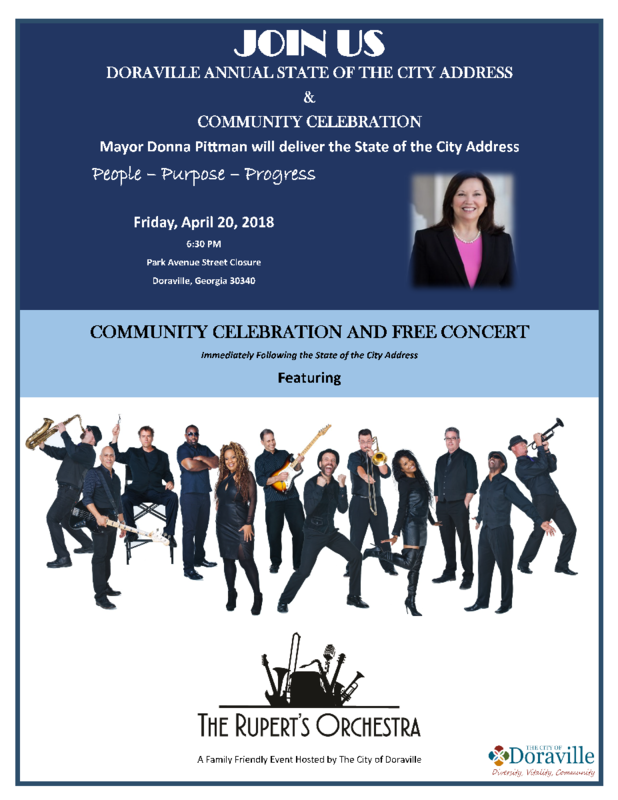 The outdoor event, free and open to the public, will take place on Park Avenue (in front of Doraville City Hall, 3725 Park Ave.) and a free concert featuring The Rupert’s Orchestra will immediately follow the mayor’s presentation. Pittman’s comments will include a review of key achievements over the past year including details on the “new” Carver Hills subdivision, construction of Serta Simmons Bedding’s sparkling new corporate campus at Assembly, plans for a proposed elementary school along New Peachtree Road and updates on the Design Doraville initiative that will provide a blueprint for Doraville’s growth for the next 20 years. Activities start at 6:30 p.m. There will be limited outdoor seating (guests are welcome to bring lawn chairs) and food vendors will be on-site offering a selection of great food at reasonable prices. Following the mayor’s address, a free community concert will be presented by The Rupert’s Orchestra, beginning around 7:45 p.m. The Rupert’s Orchestra became nationally known for their exciting performances at Rupert’s Nightclub in Buckhead. For over eight years they played to packed houses and were voted Atlanta’s best house band every year. They have since become the top party band in the Southeast. Rupert’s Orchestra performs everything from current Top 40 hits to Motown, R & B, Classic Rock and Big Band Swing.